Actually, we planned to see the route of Mohare Danda and took a drive to Beni (Mallajs) from Pokhara. Our Porter Jivan have been walking this trail so we were kind of confident that he is directing us in the right direction. Indra walked this trail years ago and that time there were no roads but he wasn't sure about how actually the trail looks like this day. 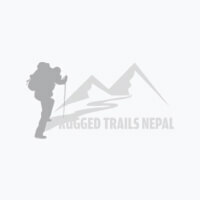 Rugged Trails Nepal other guides and also some of our groups did Mohare Danda trek but Personally being a leader of a company I wasn't sure so I decided to join with them. Our clients Adam and Sophie were friendly and flexible with the trip plans. Very few clients are like that who are ready to accept the last minute changes. Thanks, Adam and Sophie for being flexible! guides and company change the plans something best knowing their interest meeting in person. As I had already mentioned about the trek will be quite off the beaten and it's a community-based trek. On the first day after a long bumpy drive to Mallas, we started our hike towards Mohare Danda. The Frist of the trek was quite interesting because the village is not so far from the main town (Beni) but still we can see the unchanged and typical lifestyle of Nepalese people. Mostly the trail was on road and we took some shortcut trail to avoid roads but there weren't vehicles just a few tractors. Almost 3 hours hike to BansKharka passing through the villages, farms, and interesting temples which were built by Mallas people. When we arrived at the place where we had booked it was Homestay, we had to wait for 30 minutes because the house owner wasn't there. Till then the sunset view was amazing, check the pic below. We stayed with the family but the food was prepared in a small community house and needed to walk 5 minutes from the house. She was a bit nervous with the food orders and she was alone so we helped her to prepare food. The second day from BansKharka to Nagi Village was kind of intense because it was uphill from the beginning and the weather report was showing that it's gonna rain. After breakfast, we started our journey to towards Nagi village passing through beautiful Rohodondren forest. Spring is one of my favorite seasons to trek in the foothills of Annapurna because of beautiful flowers and the bird's sounds. It was cloudy so we couldn't see the Himalayas on the way but in the Morning from BansKharka we saw a top of Mt. Dhaulagiri. There were trail markers on the way but it's not clear enough people easy can get lost in another season not everything is dry and can see things around but other time communities need to manage it. So the Lunch spot was in the village and there were 2 boys who were taking care of it we helped them too to prepare food and leave for Nagi. We were in a rush because of the weather but thank god when we reach Nagi Lodge started raining. Personally, within a short day, I haven't imagined the village lifestyle is soo unchanged and can see the remoteness lifestyle. Had done many other Trips in Everest, Langtang but this was quite special experince. At Nagi can take a hot shower, sunset view was perfect and the Dhaulagiri, Annapurna South was not clear but still beautiful. Seriously if you are looking for less tourist on trek then Highly recommended Mohare Danda Ghorepani Trek. So the third Day the Main highlights of trek Mohare Danda View Point. I woke up early morning to take some shots which was disappointing because it wasn't fully clear and clouds were moving. After breakfast when we walk 50 M up then the view was beautiful with the Dhaulagiri Ranges. Check Pic below. From Nagi to Mohare Danda was about 5-6 hours trek inside the forest. Interesting flora and obviously different colors of Rhododendron flowers and some wildflowers too. Almost 2-3 hours was inside the forest and after that, we reach the lunch spot which doesn't even looks like a wooden bathroom (seriously) but thank god there was something to eat. The guy who was there was kinda slow and don't even know how to handle and make it fast. We helped to make Dal, Curry, tea coffee it was fun to share and work because it was warm to stay next to the fire and it was very cold. After a quick lunch, we started our last move for Mohare Danda, started raining and on the trail, there was snow. We didn't see anything because of clouds keep following the trail to Mohare Danda and stayed inside the tea houses. It was so nice and warm inside because of fire, people were friendly nice. We reached there by 2 and now nothing to do because it was raining outside well keep praying for the morning view. I was sure that the morning will be clear but still Unbeliable when I looked outside 2 am in the morning starts and Moon was shining the Himalayas was shining like a diamonds. It was soo windy and cold outside and didn't think to take pictures but couldn't sleep after that. Around 5 fall sleep and after 30 minutes woke up and was so desperate to go outside for the sunrise view. Mohare Danda Viewpoint is better then Poonhill because from here we can see Mountains closer and the Landscapes is beautiful. We can even see Pokhara and more panoramic Himalayan views. Took some nice shots and was enjoying the view with the coffee. The Morning was beautiful and after breakfast, we head down to Poonhill, Ghorepani. From Mohare Danda we can go to Khopra Trek, Tadapani, Ghandruk and so on but we had a Plan to walk to Ulleri via Ghorepani. The view was amazing and better than Poonhill so we didn't stop Poonhill and went to Ghorepani for Lunch. Probably that day was clear from the Morning till to the Night because there were no clouds nothing just the clear blue sky. This was our Short Mohare Danda Ghorepani Trek story if you ready for this trip simple write and as always we try to give the best from us in a friendly way. Traveling with experienced guides and company means you will get more information and details about the places, people and safety. Tell us your ideas and let us work for your plan you choose the best for you.